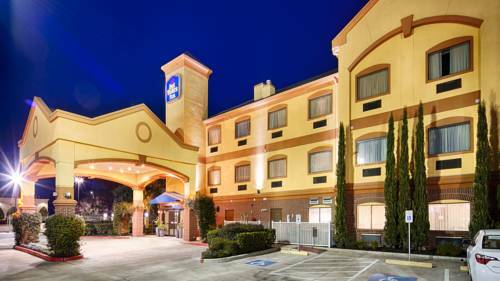 The Best Western Plus Sam Houston Inn & Suites welcomes you to Houston! Our beautiful new facility is designed to meet the needs of both the corporate and leisure traveler with each room offering standard features such as complimentary high-speed Internet connectivity, micro-fridge, coffee maker, full size ironing board and iron, hairdryer, spacious work desk and a 37-inch HD LCD television with over 30 channels including a free movie channel. In addition we offer a business center (free to our guests), fitness room, guest laundry, meeting room, outdoor pool, and a complimentary breakfast and coffee each morning. Enjoy the excitement of live quarter horse racing from late July through early April just minutes from the property. The Best Western Plus Sam Houston Inn & Suites offers excellent facilities and amenities. Our staff is eager to help create the greatest lodging experience while visiting the beautiful city of Houston. �From: The north. Take Beltway 8, exit North Gessner Road, turn left on North Gessner Road to the Best Western Plus Sam Houston Inn & Suites. �From: The south. Take Beltway 8, exit North Gessner Road, turn right on North Gessner Road to the Best Western Plus Sam Houston Inn & Suites. Adjacent to Jack in the Box, 6:00 a.m. to 9:00 p.m.
4 mile(s) from Papadeaux and Papasitos, 11:00 a.m. to 10:00 p.m.
1.5 mile(s) from Kirins Japanese, 11:00 a.m. to 2:30 p.m. and 5:30 p.m. to 10:00 p.m.
Across the street from Sonic, 6:00 a.m. to 9:00 p.m.
1 mile(s) from Hickory Hollow BBQ, 11:00 a.m. to 9:00 p.m.